Mohandas Karamchand Gandhi was the preeminent leader of Indian nationalism in British-ruled India. One technique Gandhi used frequently was the fast. He firmly believed that Hindu-Muslim unity was natural and he undertook a twenty-one-day fast to bring the two communities together. He also fasted during a strike of mill workers in Ahmedabad. Another technique he developed was the protest march. 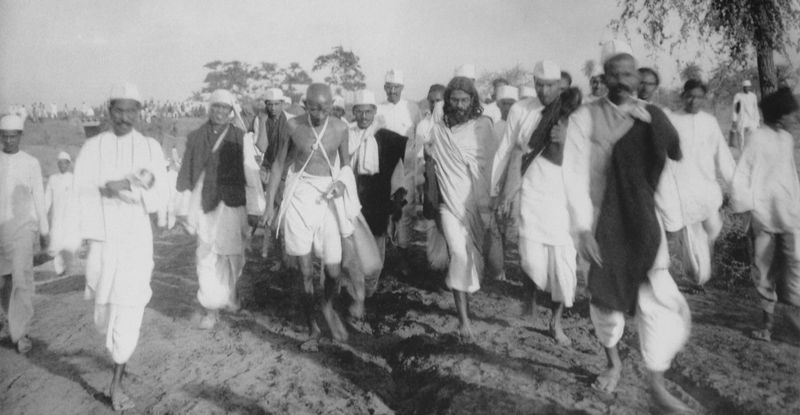 In response to a British tax on all salt used by Indians, a severe hardship on the peasants, Gandhi began his famous twenty-four-day salt march to the sea. Several thousand marchers walked 241 miles to the coast in protest of the unfair law. Another cause Gandhi supported was improving the status of members of the lower castes, or Harijans. On September 20, 1932, Gandhi began a fast for the Harijans, opposing a British plan for a separate voting body for them. As a result of Gandhis fast, some temples were opened to exterior castes for the first time in history. Gandhi devoted the years 1934 through 1939 to the promotion of making fabric, basic education, and making Hindi the national language. During these years he worked closely with Jawaharlal Nehru (1889?1964) in the Congress Working Committee. Despite differences of opinion, Gandhi designated Nehru his successor, saying, I know this, that when I am gone he will speak my language.